Do you write down your tasks on a daily to-do list? I would be lost without mine. If I’m being honest, sometimes I’ll even write down things I just completed just so I can cross them off! 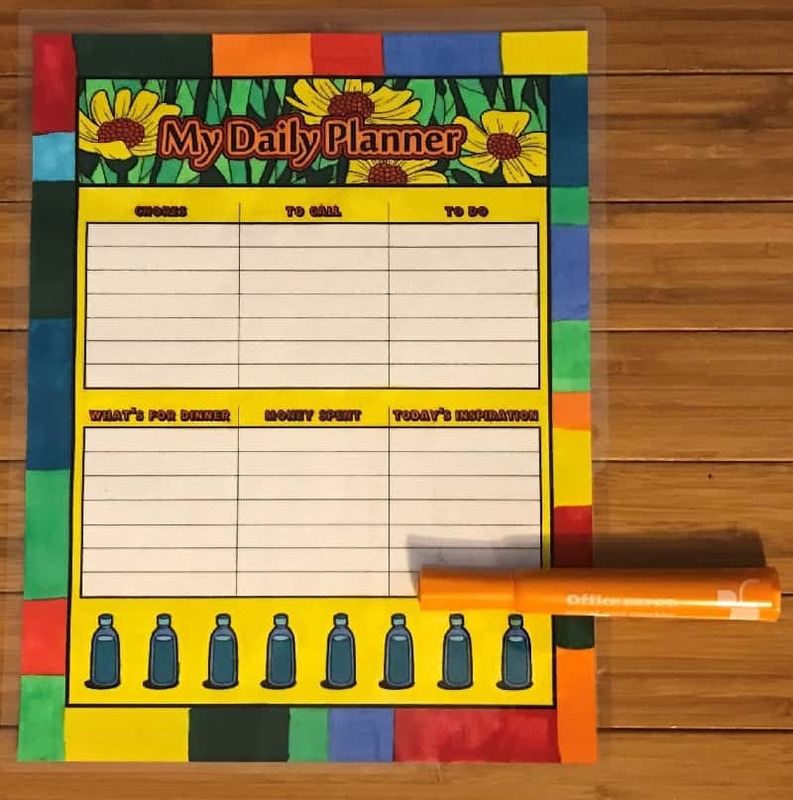 Color Happy includes a “My Daily Planner” coloring page in each month’s collection. It’s a fun way to add some color to your day. But, I will admit, trying to color a new to-do list each and every day might get sort of redundant. So, I suggest you only color one each month, and REUSE it! 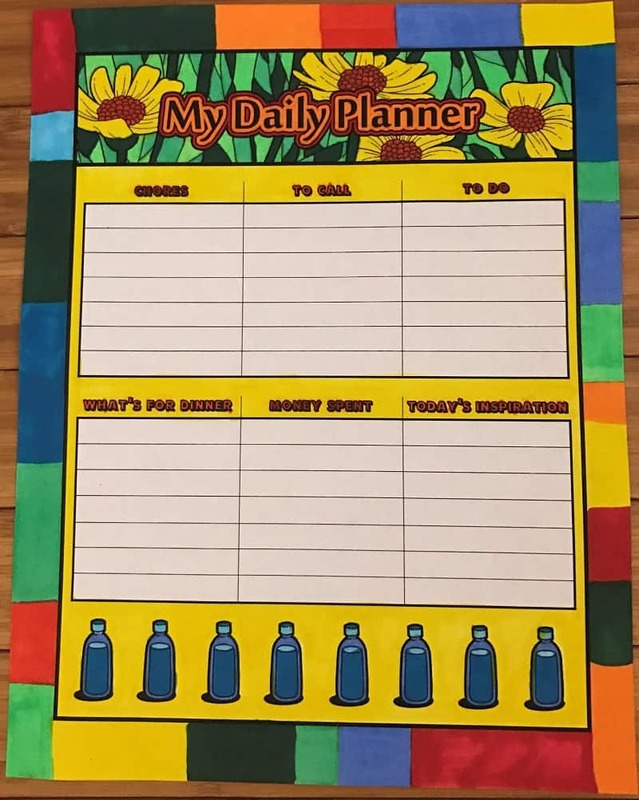 Simply color your “My Daily Planner”, but leave the individual lists blank. 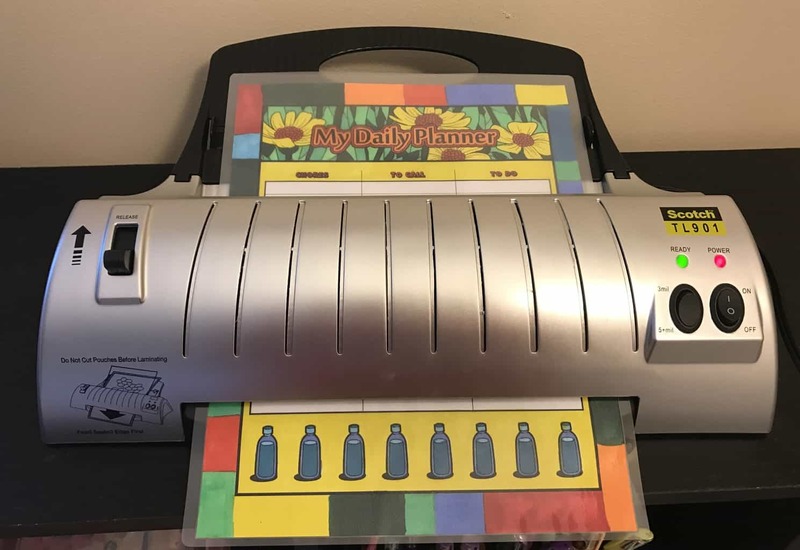 Then, you can either run it through a home laminator, like I’ve done here, or if you don’t have one (I got mine for $30 on Amazon, and use it for a surprising amount of things) you can use a simple plastic page protector sleeve. Use a dry erase marker to write down today’s tasks, and cross them out when you’re done. The whole thing wipes down so you can start fresh in the morning! Plus, as part of Color Happy, you’ll have the opportunity to share our great program with your friends and earn commissions if they decide to get their color on as well. Question – how do you organize your coloring books and supplies? I recently retired this old dish drainer in favor of one that had a little spout so the water would drain nicely back into the sink, but I HATE throwing stuff away that can be up-cycled. So, I decided to use it to organize some of my coloring books! They fit perfectly into the little plate slots, and it’s an easy, portable way to move my books from the office to the living room. 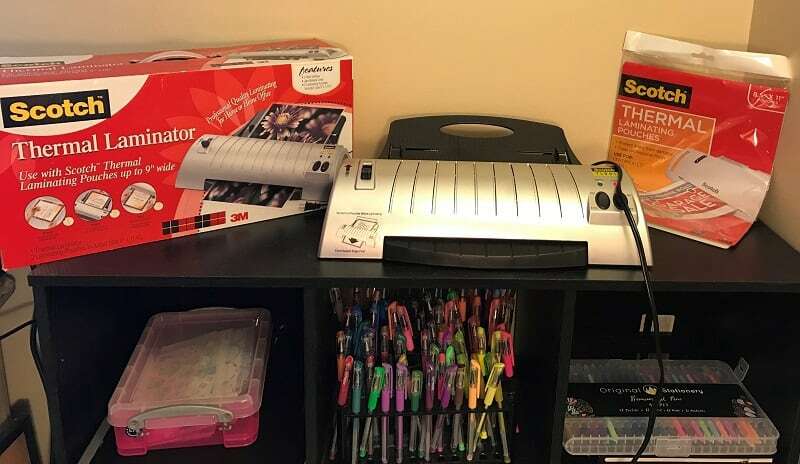 Share a picture with your coloring book organization methods! Welcome to Day 4 of Coloring Christmas! If you’re looking for a Christmas gift for a coloring pages enthusiast, (or if you’re the enthusiast and you’re looking for more goodies for your coloring stash) you’ve come to the right place. I’m using the WooCrafts Art 96 Holes Pencil Holder. It is super compact and takes like 2 seconds to assemble. It fits standard sized Sharpies PERFECTLY as well as the fine tip ones. The brush tip Sharpies don’t fit, but I really don’t have a lot of those, so it’s easy to find the colors I need separately. It will hold markers, colored pencils, gel pens, pretty much anything the size of a standard Sharpie or smaller. I’m going to buy a second one for my colored pencils. Well, actually, I’ll probably need two more as I have a LOT of colored pencils. When I color with other people, I’ve found that its super easy to prevent markers and gel pens from getting lost – if you’ve got an empty hole, you’re missing a marker. And don’t forget the BEST holiday gift of all for anyone who loves coloring – ColorMonthly’s All Access Gift Pass. Give them a year’s worth of coloring projects for less than a dollar a week. Leave a comment below and tell us – How do YOU organize your coloring supplies? Welcome to Day 3 of Coloring Christmas! Today, I want to show you my mini-obsession – Pipsticks. I’ve been a subscriber to Pipsticks for a few months now, and it’s a lot of fun. Stickers are fun. Growing up, I used to horde my stickers. I’d put them, unused, in a big box and would just love looking at them. Then one day, as an adult, I realized the best part of having stickers was to use them! I put them on envelopes I send via snail mail (even bills), I dress up birthday present wrapping paper with them, and I stick them on random notes I write to the kids. If you are a recovering sticker hoarder like me, I hereby give you permission to USE ALL THE STICKERS! There will be more! My favorite part of the Pipsticks kit I get every month is the postcard – and it comes with a stamp (which means I’ll actually mail it to someone, lol). Sometimes I’ll color the plain back side and put some stickers on it. This time, I decided to recycle an old coloring page I colored. This is one of Color Monthly Premier pages from 2016. I simply cut it out to fit the size of the postcard, and using a glue stick, glued it on. As you can see, it’s totally NOT fancy. Fancy takes effort. I just like FUN! So, I decorated it with some of my Pipsticks, a voila! An eccentric postcard to send to my daughter. Stickers make great stocking stuffers. Check out all of Pipsticks here. Or, subscribe to a monthly plan (cancel anytime). And of course, the most fun you can give to a coloring enthusiast this holiday season is our All Access Gift Pass – a whole year of coloring pages delivered monthly. Hurry! The price goes up soon – AND, this will NOT be offered in 2017. This is your chance to get it at the best price ever! Welcome to Day 2 of Coloring Christmas, where I share my top 12 picks for gifts for coloring enthusiasts this holiday season! Today I want to share with you my travel coloring kit. It came in handy this week for me as I moved from my condo to a new house and all of my regular coloring supplies were buried in boxes. When I color, I put my pages on a clipboard. One of my favorite coloring tools are Sharpie markers, which will absolutely bleed through the page I’m coloring and sometimes even an extra page underneath. Placing my coloring pages on a clipboard keeps the bleed through contained. I stumbled upon this great clipboard box while looking for new coloring supplies on Amazon a few weeks ago, and I absolutely LOVE it! It’s good quality, and can carry a large amount of pages AND supplies. I do wish there were options this size in colors other than black (they have a smaller/thinner one in blue)…I’ll probably decorate it with my Metallic Sharpies one of these days. When you open the box, the first half has room to store coloring sheets. There’s a pocket folder for them on the right, or you can just stack them up on the left. Plenty of space for traveling (or just sitting on the couch watching TV while coloring, trying to keep everything contained). And behind the pocket folder is a great divided tray for coloring supplies. Markers and pencils of all sizes will fit in 3 of the divided sections. The itty bitty spot is great for a pencil sharpener. The one spot that I have scissors in, none of my regular sized markers fit into, but it’s still a great compartment for other coloring supplies you might need. Or really short/used up pencils. And don’t forget the BEST gift of all! A whole year of ColorMonthly. Subscribe to our All Access Gift Pass for yourself and a friend. But first, a holiday gift for you. Download your free Holiday Gift Tags coloring template. Color these pretty designs to decorate your Christmas presents this year! I had a blast coloring mine this week. And I used my first pick for the 12 Days of Coloring Christmas – Original Stationary’s Set of 48 Gel Pens. They were kind enough to send me a set for review. I gotta tell you, for the price, they can’t be beat! At around $20 for the set (with a carry case) they’re affordable, and the variety of colors will make you very happy. They come with metallic, neon, glitter, and waterchalk. The waterchalk is a pretty pastel. The really cool thing about this set is how fine tip they are. Great for coloring in detail. And no problems with the ink pooling or bleeding through the paper. But the best part of all: they come with a one-year warranty. So no worries about them breaking or drying out too soon. You can follow Original Stationary on Instagram @originalstationery and you can pick up your set of 48 Gel Pens on Amazon here. And don’t forget! The best gift you can give a coloring lover this holiday season is a full year of ColorMonthly.com!